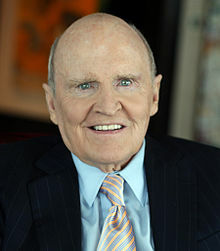 John Francis "Jack" Welch, Jr. (born November 19, 1935) was Chairman and CEO of General Electric between 1981 and 2001. During his tenure, GE increased its market capitalization by over $400 billion. He also oversaw the firing of more than 100,000 GE employees, and was awarded a severance package of $417 million when he retired in 2001, the largest such payment in history. At the heart of this culture is an understanding that an organization's ability to learn, and translate that learning into action rapidly, is the ultimate competitive business advantage. Six Sigma has forever changed GE. Everyone—from the Six Sigma zealots emerging from their Black Belt tours, to the engineers, the auditors, and the scientists, to the senior leadership that will take this Company into the new millennium—is a true believer in Six Sigma, the way this Company now works. The best Six Sigma projects begin not inside the business but outside it, focused on answering the question—how can we make the customer more competitive? What is critical to the customer’s success?... One thing we have discovered with certainty is that anything we do that makes the customer more successful inevitably results in a financial return for us. Loyalty to a company, it's nonsense. I enjoy challenging a person's ideas. No one loves a good and passionately fought argument more than I do. This isn't about being tough-minded and straightforward. That's the job. But so is sensing when to hug and when to kick. Of course, arrogant people who refuse to learn from their mistakes have to go. If we're managing good people who are clearly eating themselves up over an error, our job is to help them through it. That doesn't mean you have to take it easy on your top performers. I wanted to change the rules of engagement, asking for more— from fewer. I was insisting that we had to have only the best people...If you wanted excellence, at a minimum, the ambience had to reflect excellence. In GE every day, there's an informal, unspoken personnel review—in the lunchroom, the hallways, and in every business meeting. That intense people focus—testing everyone in a myriad of environments—defines managing at GE. In the end, that's what GE is. We build great people, who then build great products and services. In manufacturing, we try to stamp out variance. With people, variance is everything. Change has no constituency—and a perceived revolution has even less. There are advantages to being the chairman. One of my favorite perks was picking out an issue and doing what I called a "deep dive." It's spotting a challenge where you think you can make a difference—one that looks like it would be fun—and then throwing the weight of your position behind it. Some might justifiably call it "meddling." I've often done this—just about everywhere in the company. If you like business, you have to like GE. If you like ideas, you have to love GE. This is a place where ideas can flow freely from and through more than 20 separate businesses and more than 300,000 employees. Boundaryless behavior allows ideas to come from anywhere. We formalize our freewheeling style in a series of operating meetings that blend into one another. Being a CEO is the nuts! A whole jumble of thoughts come to mind: Over the top. Wild. Fun. Outrageous. Crazy. Passion. Perpetual motion. The give-and-take. Meetings into the night. Incredible friendships. Fine wine. Celebrations. Great golf courses. Big decisions in the real game. Crises and pressure. Lots of swings. A few home runs. The thrill of winning. The pain of losing. It's as good as it gets! You get paid a lot, but the real payoff is in the fun. Getting every employee's mind into the game is a huge part of what a CEO job is all about. Taking everyone's best ideas and transferring them to others is the secret. There's nothing more important. Getting the right people in the right jobs is a lot more important than developing a strategy. Arrogance is a killer, and wearing ambition on one's sleeve can have the same effect. There is a fine line between arrogance and self-confidence. Legitimate self-confidence is a winner. The true test of self-confidence is the courage to be open—to welcome change and new ideas regardless of their source. Self-confident people aren't afraid to have their views challenged. They relish the intellectual combat that enriches ideas. Business success is less a function of grandiose predictions than it is a result of being able to respond rapidly to real changes as they occur. One of the office world's most celebrated plutocrats was General Electric CEO Jack Welch, who coined the famous Welchism that employees have unlimited juice to squeeze, and who loved to tell people to "face reality." He earned the nickname Neutron Jack for having fired one hundred twenty-eight thousand of his employees and later boasting that all that was left after his mass firings were the buildings. That, and an enormous amount of cash for Jack and his happy shareholders. Yuk-yuk-yuk. Some people may not find his kind of humor to their liking, but it probably bowled 'em over in Kennebunkport, or the Hamptons, or the Berkshires, or any number of corporate billionaire hangouts... Of course, this doesn't mean that Jack Welch doesn't have a heart. In his autobiography Straight From the Heart, a New Age-infused ego-romp that sold like hotcakes to the credulous masses, Welch did manage to share his thoughts with us on the importance of friendship... buried in the section "A Short Reflection On Golf." Just in case you didn't think he was, uh, human, you see. United for Fair Economy, an advocacy group, described Welch's feudal wealth this way: "If Mr. Welch's $83 million total compensation in 1998 were represented by the height of the Empire State Building, how tall would the buildings represented by other GE workers be? The typical factory worker, earning $40,000 a year, would be represented by a building just eight inches tall. A well-compensated General Electric manager, earning $100,000 a year, would be represented by a building less than two feet tall. Considered globally, a typical employee working in a GE factory in Mexico and making $4,500 a year would be represented by a building less than one inch tall- smaller than an anthill." Welch retired just a few days before the terror attacks of 9/11 and was awarded a severance package worthy of a Saudi prince. GE gave Neutron Jack an annual pension of $9 million, health and life insurance, a $15 million Manhattan penthouse, unlimited use of the company's private Boeing 737 jet, a limo, country club memberships, VIP seats at New York Nicks and Yankees games, $7.5 million in furnishings and decorations for his four homes, and more. All this for a man who amassed a personal fortune thought to be close to a billion dollars during his years at GE, while firing one hundred twenty-eight thousand workers. The extent of Neutron Jack's pillage was only revealed after his wife busted him sleeping with another woman. She filed for divorce and sued when Welch offered her a typically Neutron Jack settlement of $15 million, a sum her lawyer termed "offensive." The ensuing Clash of the Gargoyles in the cracked Welch mansion exposed the grotesque size of his compensation, leading to a Securities and Exchange Commission investigation and eventually a pledge by Welch to pay back to GE a part of his retirement package. In spite of his loathsome, King George personality, what is most appalling is how Jack Welch managed to become absolutely adored by corporate America's white-collar suckers. His minions who stood absolutely nothing to gain and everything to lose by worshipping his philosophy of destroying tens of thousands in order to enrich a few, called themselves "Welch-heads" in another example of our Reagan-era peasant-like behavior. Most Americans today take it for granted that the workplace is unbearably stressful, fearful, and organized to transfer much of the wealth up to a tiny, privileged class of executives and shareholders at the expense of the many. But it wasn't always that way. Long before Neutron Jack, General Electric's stated relationship to their employees was deliberately paternalistic, respectful, secure, and symbiotic. In 1962, right around the time that young Jack Welch joined GE, Earl S. Willis, the manager of employee benefits at General Electric, wrote, "Maximizing employment security is a prime company goal." Later, he wrote, "The employee who can plan his economic future with reasonable certainty is an employer's most productive asset. Contrast this to Jack Welch, who bragged after one hundred twenty-eight thousand firings, one hundred twenty-eight thousand potentially ruined families, that "only the buildings remained standing." Oh, and his billion dollars in savings, his $15 million annual pension, and his company 737. Clearly for most Americans, everything is getting worse and worse. The only beneficiaries are the Chainsaw Dunlaps and Neutron Jacks. CEO of General Electric for 30 years, Jack Welch was declared the greatest manager of the 20th century. Focusing firmly on results, he revolutionized management to achieve phenomenal growth for his company. Robert Heller (2001) Jack Welch Dorling Kindersley Pub.